International Journal of Research in Health Sciences,2017,5,3,13-17. 1Assistant Professor, Dept. of Pediatric and Preventive Dentistry, Govt Dental College and Hospital, Aurangabad, INDIA. 2Professor and Head, Dept. of Pediatric and Preventive Dentistry, Nair Hospital Dental College, Mumbai, INDIA. 3Assistant Professor, Dept. of Pediatric and Preventive Dentistry, Govt Dental College and Hospital, Mumbai, INDIA. 4MDS Pedodontics Private Practitioner Mumbai India 5Post Graduate Student, Nair Hospital Dental College Mumbai, INDIA. Aim: The epidemiological study was carried out in Mumbai, in order to investigate the prevalence of molar incisor hypomineralisation (MIH) in a group of children from different municipal schools. Method: 544 children aged between 7–10 years attending municipal schools were examined for the presence and severity of MIH using criteria given by Weerheijm et al. in 2003. Descriptive analysis for distribution of various defects and comparative data analysis was carried out. 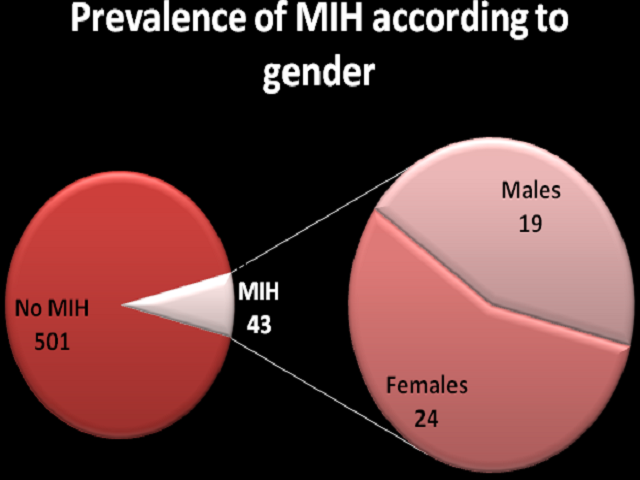 Results: A total of 544 children were examined out of which 43 (7.90%) had MIH. Amongst these 19 boys and 24 girls had MIH. Conclusion: MIH was quite common in municipal school going children in Mumbai. The defects in the molars were mild and girls (8.54%) experienced greater prevalence as compared to boys (7.22%).